The Western Agricultural Processors Association (WAPA) attended the recent CalOSHA Advisory Committee on the proposed standard for “Agricultural Operations during Hours of Darkness (between Sunset and Sunrise)”. The proposed standard would require employees working around equipment at night to wear reflective vests and for employers to provide lighting at a level of 20 foot-candle power within 25 feet of any equipment. The standard was in response to a petition by California Rural Legal Assistance (CRLA). CRLA is pushing for the standard because they accuse farmers of shifting work to nighttime hours to avoid the new heat stress regulations. CRLA, along with United Farm Workers (UFW), made accusations that farmworkers are subject to sexual harassment due to working at night. CRLA further commented that Asian farmworkers (??) have very poor eyesight and it makes for unsafe work conditions. WAPA and the California Farm Bureau Federation both made presentations on actual light measurements taken at night. 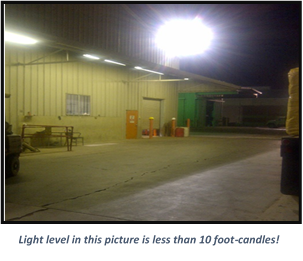 WAPA’s points were based on the fact that 10 foot-candle light power cannot be met by any equipment manufacturer’s standard lighting at 25 feet. Furthermore, WAPA pointed out that the only way to meet the proposed standard was to bringing in additional portable lighting such as the diesel fired, generator powered lighting that you see on the highway by Caltrans. Lastly, WAPA showed pictures of an area lit to a level of only 6.8 foot-candles, where a worker could see fine without any issues, including reading documents if necessary. WAPA also asked CalOSHA what accident data they had to support such changes, to which no response was received. This is no surprise, as CalOSHA recently adopted the most recent changes to the Heat Illness Standard without a shred of evidence, simply due to the threat of a lawsuit by the UFW. Based on some of the comments by CRLA and UFW, and the fact they were unwilling to negotiate on the any of the proposed revisions, we can expect to see another lawsuit or to see CalOSHA simply adopt more regulations. Representing WAPA at the meeting were President/CEO Roger Isom and Director of Environmental and Safety Services Elda Brueggemann.